April Fools! I made hot dogs out of almond cookies. It seems like we’re in outdoor grilling season in my part of the world, so it’s time to break out some weather-appropriate baked goods. It’s also time for baseball season in the States, and baseball isn’t baseball without hot dogs; at least that’s what Mr. Table says. We’ve discussed this before, but I use any sort of sports season, or random holiday, or really anything, as an excuse to make food. I geek out with it. Although I suppose, at this point, that goes without saying. So why almond cookies? Funny you should ask. When I would browse through The Art of the Cookie book (from which comes the chocolate pretzel cookies and the pistachio sables), I kept flipping over these cookies. They weren’t hot dog cookies at all; in fact, they were a rather snooty little almond-y spoonprint marmalade something-something. They looked very fancy. But they also resembled hot dogs. Or at least, in my head they did. And the mind spiraled, did a little dip, and out came this. 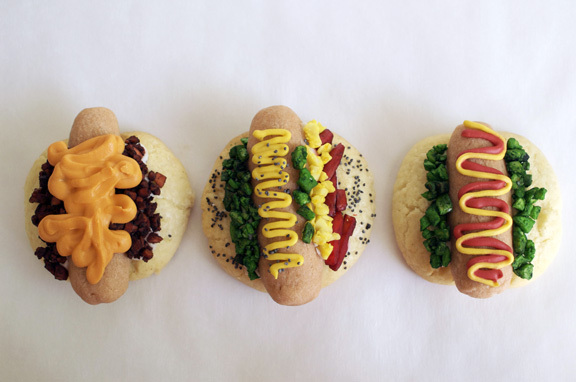 Three cute little hot dog styles, just for you. From left to right, you have your chili-cheese dog, your Chicago-style dog, and your traditional dog. And when I say “traditional,” I actually mean what I used to do with my hot dogs when I was a kid. So, my traditional. There’s going to be some step by step here, so I won’t prattle on. Even if you don’t make hot dogs out of them, this is an excellent almond cookie recipe in terms of flavor. In the original version, they are filled in the middle with a little orange marmalade, egg-washed, and sprinkled with some chopped blanched almonds. I’m sure they are delicious that way, but you won’t be hearing any giggles if you serve them like that. On to the fun. This is actually composed of two cookie recipes: the buns are the almond cookie recipe below from The Art of the Cookie cookbook, and the hot dogs are and almond variation of my own sugar cookie recipe. I tried the dogs with the almond cookie, but they over-poofed. Poofing was what I wanted in buns, but not what I wanted in the hot dogs. The sugar cookie recipe worked much better for this, and the dogs kept their shape during baking. Next up, the toppings. What you see here is all blanched almonds in various stages of chop and dye. The “relish” is blanched almonds run through a nut chopper 3 times (for variation), as are the “onions.” the “chili” was run though 4 times, twice on coarse and twice on fine chop, to give it a chili-like texture. The “tomatoes” were not chopped at all, but instead left as slivers, and I hand-snapped some of the longer ones as I sorted through them. As for the dying, it’s pretty simple: have both liquid food color and food color gel on hand. In all cases, you have to add the color, mix it around, then when it clumps up, add a few drops of water and mix again. The water thins out the gel color enough to get it worked around onto your almonds. For the onions (the only one I used only liquid food color for), you add 2 drops of yellow liquid color, stir, add a few drops of water, and so on. Remember: gel color is much more potent than liquid color, so add in extremely small amounts to get it right. I use a butter spreader, putting a little gel at a time on the very end, and adding it to the almonds. The toppings are probably the most time-consuming part, and they really don’t take a long time; they just require patience. You can’t undo food color, so it’s best to work slowly and add a little at a time until you’ve reached the color you want. I did three styles of hot dog. You only have to do one if you’d like. 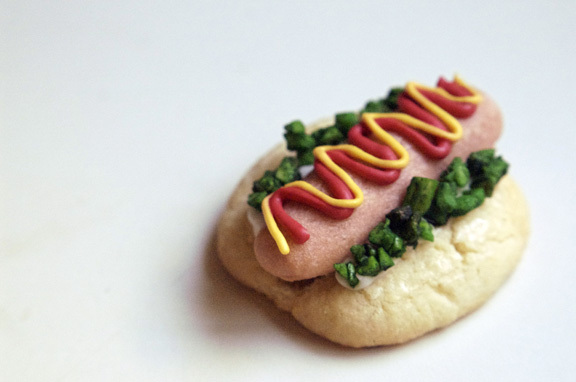 And if you like your little hot dog cookies with a smidge of mustard and ketchup on them, then you can totally skip the almond chop-n-dye bit. 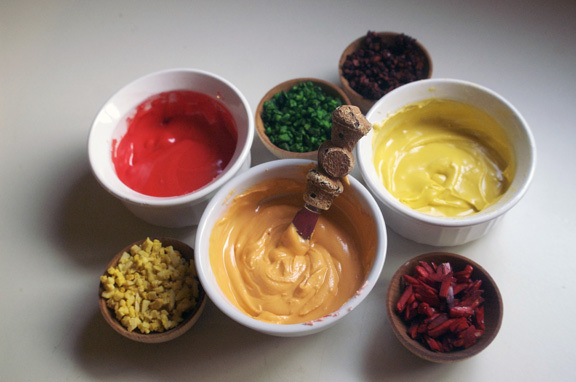 The “condiments” (ketchup, yellow mustard, cheese) are all royal icing, dyed with food color paste. I use my own royal icing recipe and sub almond flavoring for the lemon juice (but not totally; see instructions below in the recipe portion or you’ll have yourself some wicked almond-y icing) to complement the almond cookies. You’ll want to make a full batch of the icing and leave some white; you’ll need to use it for gluing your hot dogs to the bun and for gluing your almond toppings to the finished dog. Because you’re using this for detail work and glue, you’ll want to keep it on the thick side, which is easy because all you’ll need to do is add more confectioner’s sugar if it’s too thin. First, you need to assemble your hot dogs. 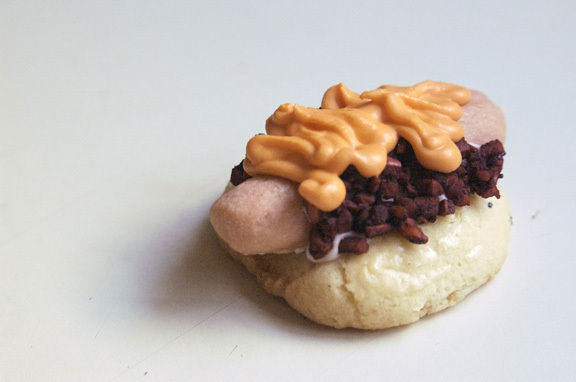 all you do is get a butter spreader (or a butter knife), put a little royal icing on it, and scoot it along the back of your hot dog, trying to get it thick enough to reach the bun cookie part, but trying to stay near the middle so it doesn’t ooze out. Alternatively, you can put the icing in a zipper sandwich bag, cut a wider hole in a corner, and squeeze it onto the dog, pastry-bag style. If you’re doing the almond toppings, you don’t have to worry about this as much; the toppings will cover any mistakes. Firmly press the icing-ed hot dog onto the bun. You can do these several at a time, up to a half-dozen in a group, before moving on to the next group. Now for the toppings. I’m going to use the Chicago dog example as my how-to guide, as that was the most complicated to do. Once you see how this one is done, the other ones, should you choose to make them or any other version, should be easy. And my apologies for the photos; royal icing is a fabulous glue, but you don’t want to leave it sit, or it will harden. If you haven’t done so already, put some of the white icing in a zipper storage bag, cut a small hole in a corner of the bag, and gently squeeze your icing down to the hole. 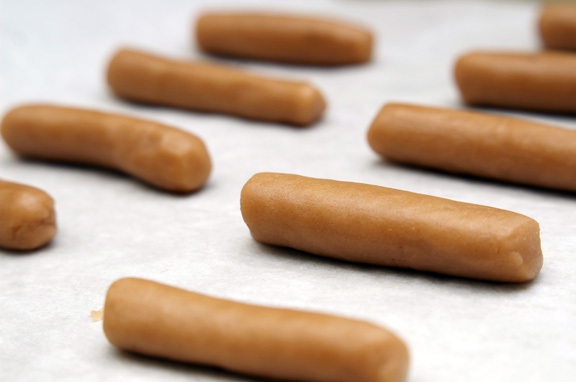 Figure 1: Slide the icing bag slowly across the lower sides of the hot dog, right where the hot dog and bun meet. Keep in mind how much you want to pile the toppings, and make your lines wide enough to accomodate. Figure 2: Using your fingers, place the tomatoes in a row on the bottom nearest the bun, pressing them into the royal icing a little. Figure 3: on the same side and using your fingers, place the onions above the tomatoes, pressing into the icing so they stay up. Figure 4: turning your dog around, and again using your fingers, place the relish on the icing, starting at the bottom near the bun and ending at the top of your icing. Then squiggle your mustard-colored icing on top, and scoot a line of mustard icing near the onions. sprinkle more of the relish on top of the thin line (for pickles), pop some more poppyseeds on the mustard squiggle (for the celery seed part), and you’re done. My childhood dog. I was big into sweet relish. Or save yourself time, do a little ketchup and mustard squiggly on there and call it a day. 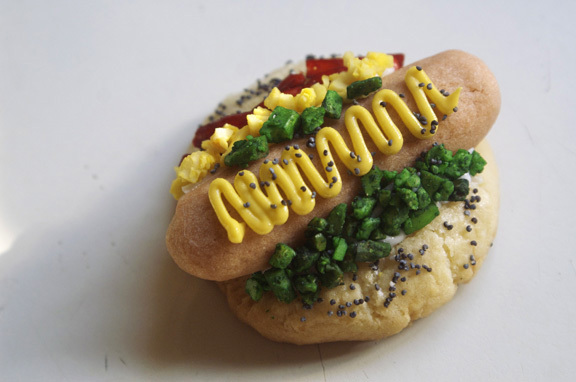 I liked the relish addition on this because it helps make the bun proportionally “fit” the hot dog part, and it hides any errant white icing used to glue the two together. 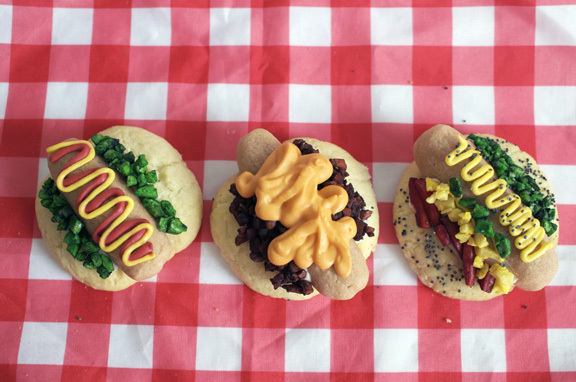 And then you can have a hot dog picnic. Have so much fun with these cookies. Neither cookie recipe is difficult to throw together (and in the case of my sugar cookie hot dogs, I actually throw ingredients in my food processor) or roll out, and the icing is a breeze too. Happy April Fools/Unseasonably Warm Spring/Baseball Season to you. Adapted from The Art of the Cookie: Baking Up Inspiration by the Dozen by Shelly Kaldunski. And I’ve done so many recipes from her book recently, I typed that entire thing out just now from memory. Seriously, check this book out. If you like to make cookies, her book has some really interesting decorating ideas along with some great cookie recipes, and that combination is rare. slivered blanched almonds (in the quantity you need, depending on how many versions you want to make, and if you’re putting any toppings on them. In a bowl, whisk together the 1 1/2 cups flour, almond flour, and salt. In a stand mixer fitted with the paddle attachment (or in a large bowl using a stand mixer), beat together the butter and sugar until light and fluffy, 2-3 minutes. Add the egg yolk and almond extract and beat on low speed until the egg is completely incorporated. Scrape down the sides of the bowl. Beating on low speed, add the flour in 3 parts, beating a few seconds after each addition, until just incorporated. Scrape down the sides of the bowl as needed. Shape tablespoons of the dough into balls, and then using the palms of your hands, roll the balls out slightly until they form slightly egg-shaped ovals. Space the cookies about 1 inch apart on prepared pan. Using the floured handle of a wooden spoon, make a deep indentation lengthwise down the oval-shaped dough, until you have what looks like an empty bun. Clean up the top and bottom as needed (you may have to slightly press the dough back together after pressing). In a small bowl, mix the egg white with 2 teaspoons of water and brush over the buns. 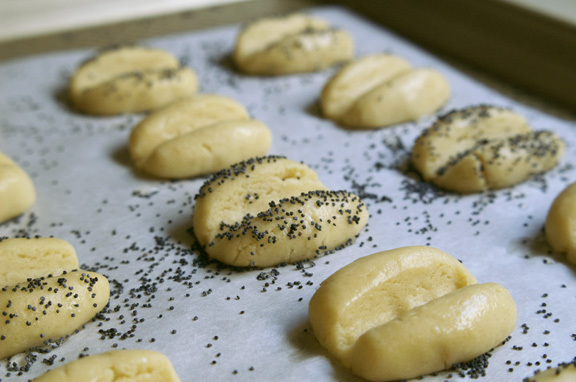 If you’re making poppyseed buns, sprinkle poppyseeds over the sides of each bun. Bake for 17-19 minutes, checking at the 15-minute mark for doneness, until the cookies are light colden around the edges. Let cool on the baking sheet for 10 minutes, then transfer the cookies gently to wire racks to cool completely, about 30 minutes. Make the sugar cookie dough according to directions, remembering to substitute the almond extract for the vanilla. Add food color gel before the dry ingredients and mix until slightly darker than desired color is achieved (remember: once you add the other ingredients, the dough will lighten up a bit). Shape dough into a disk, wrap tightly, and refrigerate until very firm, at least 2 hours. When dough is thoroughly chilled, remove from refrigerator. Take chunks of dough the size of a little more than a teaspoon and shape into balls. Using your fingers lengthwise, roll out the ball (i think it’s easiest to do this on a sheet of wax paper) to form the “dog” shape. Place 1 inch apart on a sheet pan lined with parchment paper. Bake for 13-15 minutes until just slightly golden. Let cool on sheet pan for 10 minutes and transfer to wire racks to cool completely. See instructions above if you would like to chop your almonds like I did, or feel free to freehand it to get the size you want. Anything goes here, really, so I’m just giving you some easy guides. Once you’ve chopped your almonds, separate them into color bowls and add food color to your liking, thinning out with a few drops of water to get the color to spread. 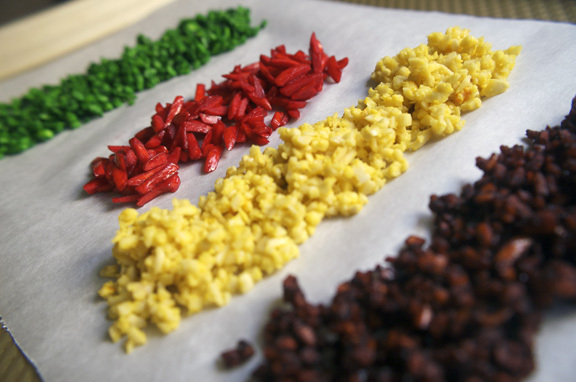 Once you have the color as you like it, spread all your almonds out onto a sheet pan lined with parchment paper. Bake for 10-12 minutes until you see the almonds on the edges of each bunch starting to darken; you don’t want to burn them. Remove and let cool on the sheet pan. Make the batch of royal icing according to instructions, remembering to substitute the almond extract/water combo for the lemon juice. Add enough confectioner’s sugar to give it a glue-like, sturdy consistency that will hold its shape but be easy to work with. Separate into bowls and color with food color paste gel. 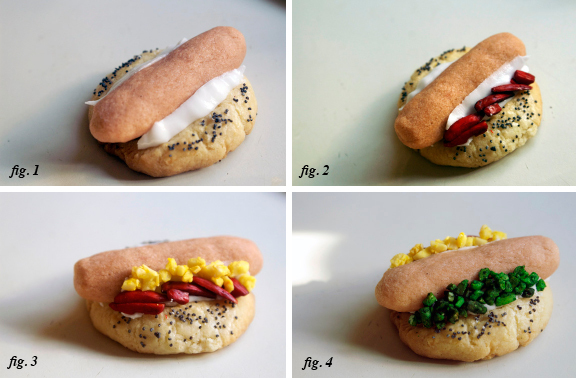 First assemble your hot dogs/buns, using the instructions/photos above. Next, decorate with your toppings (almonds), and then finish with your icing condiments, using the instructions and photos. Let dry completely before serving. 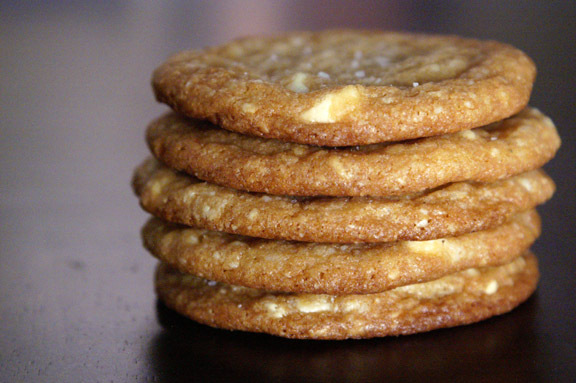 Cookies will keep for up to 4 days in an airtight container at room temperature. Makes about 30 complete cookies, when all is said and done. Happy April Fool’s!!!!! These cookies are SO stinkin’ cute. I’m wondering if I can adapt the recipe to do at school with my kids if I bake everything off before hand. They would LOVE these! Also, I made your lemon drop cakes today. My wife came OUT OF HER CHAIR to run to the kitchen and get another one. We love you and want you to come and visit us someday. You don’t even have to bring anything. 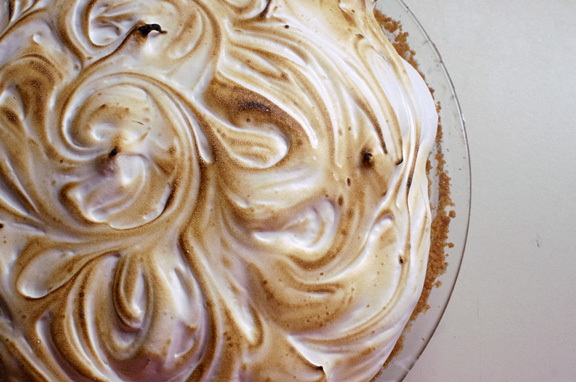 We just think only someone extremely fabulous would serve such yummy things all of the time. happy april fool’s to you too! i want you to do these with your kids…baking the dogs/buns/toppings off ahead of time would be easy (even if you did them on different nights) because the cookies keep really well. The almond toppings probably keep for a spooky long time as long as they’re stored in containers. i love you two too! after those gorgeous pictures i saw on the blog, i’m about ready to pack my bags and head down. and i’ll bake you anything you two want in return for lodging. This is majorly cute. I have an obsession with Chicago-style dogs, and I have no idea where it sprouted from. They’ve just been my favorite thing since I was a kid. I don’t even remember eating a Chicago dog when I was a kid! Whatevs…all I know is that Chicago dogs are totally the way to go. Did I mention how cute your cookies are?! see, now i’m a little obsessed with them myself as of late, and i don’t know the reason either. As a kid, we really didn’t even do the chili-cheese version, much less anything fancier. I think for me it’s the sheer amount of toppings and how they all work together; i love the thing where if it’s made right, you get a bite of everything in every bite. that’s my kind of hot dog. my cookies like you too. 🙂 thank you. What?! This is sheer genius! I was fooled for sure when I saw a picture of a hot dog but the title read Almond cookies! Love it! I have no words. 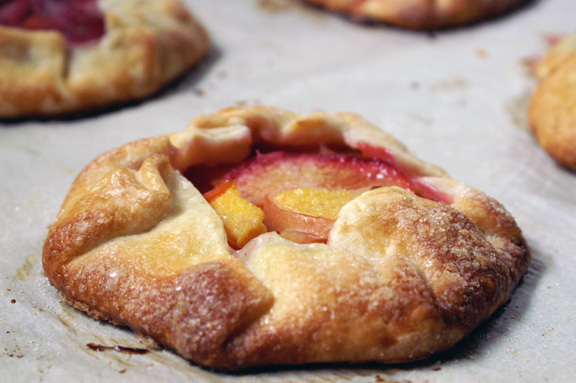 When I read the title, “almond cookies, shaped like hot dogs” in my google reader, I choked on my coffee. And when I opened the post, I yelped so loudly that ebony-the-deaf-cat actually HEARD ME. These cookies are brilliant. BRILLIANT. I WISH I COULD SAY SOMETHING ELOQUENT ENOUGH TO BE AS AWESOME AS THESE COOKIES, BUT I HAVE RESORTED TO YELLING INSTEAD. I WOULD SHAKE YOU BY THE SHOULDERS IF I COULD. i love, love, LOVE it when you yell at me. i take it as the highest form of compliment when you are reduced to screams even your deaf cat can hear. tell ebony i say HI!! we’ve known each other for what, months now, and i love your food/writing, you seem to love mine, you’re going to baking school, which means you’ll only get better, so…yes. i will marry you. but only if we can have hot dog cookies at the wedding. jam macaroons + a thank you note.